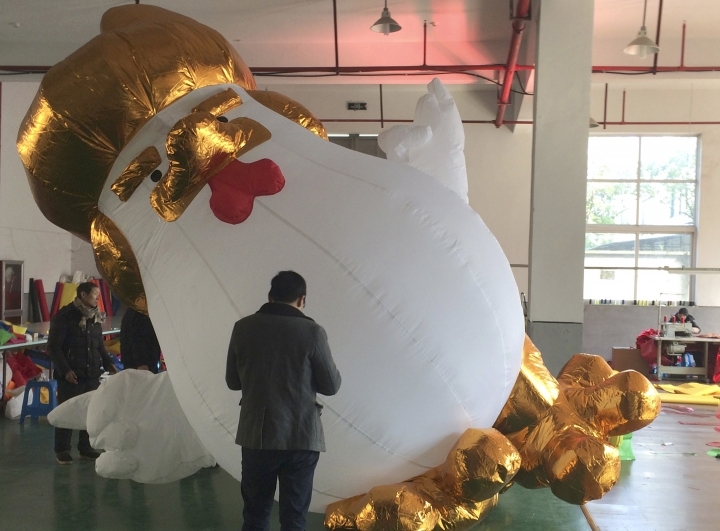 JIAXING, China — A Chinese factory has been doing a brisk business selling giant inflatable roosters, some as tall as 16 feet, based on a design widely perceived in China to resemble President-elect Donald Trump. Yifang Inflatables, a factory in the city of Jiaxing, near Shanghai, began selling the inflatables after images of a large sculpture of a similar design outside a shopping center in the northern city of Taiyuan went viral on social media last month. The original statue was designed by U.S.-based artist Casey Latiolais, whose website displays the rooster next to a similar design that borrows elements of a Trump election slogan. Chinese state media have described the rooster as "sporting the President-elect's signature hairdo and hand gestures." Wei Qing, owner of the factory in Jiaxing, said they have sold around 100 of the roosters, in sizes from 2 to 5 meters (7 to 16 feet) tall, to shopping centers in mainland China and Taiwan. 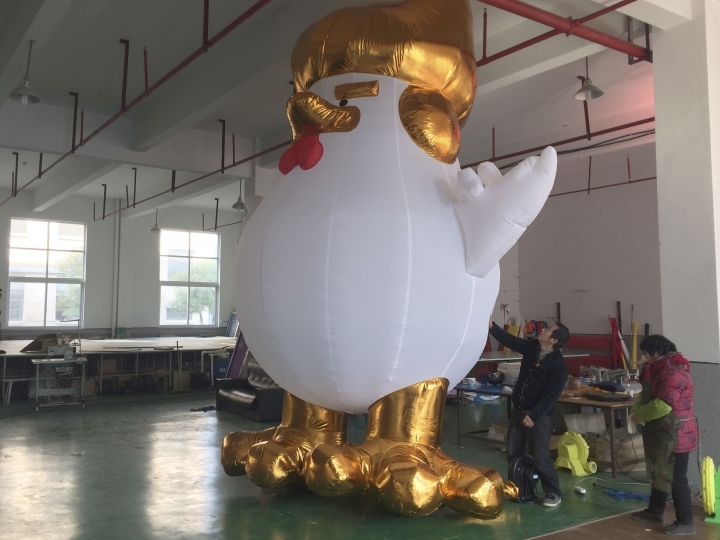 Wei said some customers think the rooster resembles Trump but that the manufacturers had no say over that. The social media sensation comes as China prepares to celebrate the lunar Year of the Rooster starting Jan. 28, the country's most important traditional holiday. "It does seem like it's got a personality, more so than chickens in previous years" in the Chinese zodiac, Wei said. "But because this is China's Year of the Rooster, it has gone viral on the internet." "I think this chicken is really special, so I decided to manufacture it," Wei added.